Logic decoders and logic demultiplexers are integrated circuits (ICs) that move data between inputs and outputs. Logic decoders convert coded information into a familiar or uncoded form so that, for example, binary coded decimal (BCD) numbers can be converted into digits that display on a seven-segment calculator. Logic demultiplexers switch digital data from one input line to several output lines in a specific time sequence. They are often used in telecommunications applications. Logic decoders and logic demultiplexers are available with 1 to 4 input lines and 2, 4, 6, 8, 10, 14, or 16 output lines. Both types of devices have inverted outputs so that the selected output is set to 0, while all of the other outputs remain at 1. Logic decoders can be used individually, or connected together for use as demultiplexers. The operating current is the minimum current needed for active operation. The propagation delay is the time interval between the application of an input signal and the occurrence of the corresponding output. Power dissipation, the total power consumption of the device, is generally expressed in watts or milliwatts. Some logic decoders and logic demultiplexers are radiation hardened or tolerant. Others include circuitry for protection against electrostatic discharge (ESD). Selecting logic decoders and logic demultiplexers requires an analysis of logic families. Transistor-transistor logic (TTL) and related technologies such as Fairchild advanced Schottky TTL (FAST) use transistors as digital switches. By contrast, emitter coupled logic (ECL) uses transistors to steer current through gates that compute logical functions. Gunning with transceiver logic (GTL) and gunning with transceiver logic plus (GTLP) are also available. 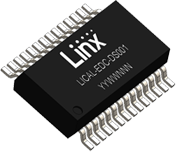 Logic decoders and logic demultiplexers are available in a variety of IC package types and with different numbers of pins and flip-flops. Many packaging variants are available. For example, BGA variants include plastic-ball grid array (PBGA) and tape-ball grid array (TBGA). QFP variants include low-profile quad flat package (LQFP) and thin quad flat package (TQFP). DIPs are available in either ceramic (CDIP) or plastic (PDIP). DOD 5962-96679 - Microcircuit, digital, radiation hardened CMOS, analog multiplexers/demultiplexers, monolithic silicon. MIL-M-38510/173 - Microcircuits, digital, CMOS, decoders, encoder, and decoders/demultiplexers monolithic silicon, positive logic. MIL-M-38510/658 - Microcircuits, digital, high speed, CMOS, decoders, monolithic silicon, positive logic. SMD 5962-94556 - Microcircuit, linear, cmos RF/video multiplexers/demultiplexers, monolithic silicon.